I enjoyed an extra long weekend, but as it is every year around the 4th of July, there were many sad dog tales. From dogs fleeing the fireworks displays and getting hit by a car or lost, to those who leave their dog in a car on a hot day only for the dog to quickly perish in the heat. There were a few other headlines too gruesome to read and I won’t repeat them here, but I was in a bit of a quandary as what to post on the blog this week. I remembered that Cookie the Smelly Beagle nominated me for a Sunshine Award a couple of months ago. Please don’t think me ungrateful for waiting almost two full months to publicly acknowledge this honor. Since it is an award that recognizes creative inspiration, I wanted to save it for when I needed some “creative inspiration.” Between BlogPaws last May and all my 4-legged visitors lately, I haven’t had to dig too deep to be inspired for material to post. So, Cookie (I’m sure you smell delightful — most of the time) thank you so much for thinking of Shoeful of Drool, it’s always great to see the words “positively and creatively inspire” associated with Shoeful of Drool! The Sunshine prize is awarded to “bloggers who positively and creatively inspire others in the blogosphere.” As an award winner, there are a few rules to follow: Thank the person (or dog, as the case may be) who gave this award to you and link to his or her blog. Answer the questions below. Pass on the award to 10 fabulous bloggers, link their blogs, and let them know you awarded them. Favorite Animal – dogs, of course! Favorite Number – 73 from my favorite t.v. show, Big Bang Theory. My passion – Dogs, writing, reading and I love eating, too! Getting or giving presents? – I like giving best, but getting is fun, too!! These next two sites aren’t really blogs, but websites that I find inspiring. I met Chilly at BlogPaws 2013 and he is part of Helping Hands Affordable Veterinary Surgery & Dental Care in Richmond, VA. Chilly works to prevent economic euthanasia! I don’t have any pictures, but I think Fire Safety Dogs is a pretty cool site that teaches fire safety to children (and the adults who may listen in). So, going through and looking at these fabulous blogs (I couldn’t resist a chance to throw in a Fabulous Knobs video) has vastly improved my mood. I know I can’t stop the suffering of all animals, I can only do what I can to love and help the animals in my life and support rescue organizations. It’s good to know there are so many others out there that feel the same way. This entry was posted in Uncategorized and tagged animals, BlogPaws 2013, canine, dogs, Dudley, Fabulous Knobs, Sunshine Award, thunderstorms, Zoe. Bookmark the permalink. Well I smell pretty awful now that I’ve just had my magnolia scented bath 😦 I love Big Bang Theory too! My mom calls me Sheldon Cookie (of Big Bum Theory). 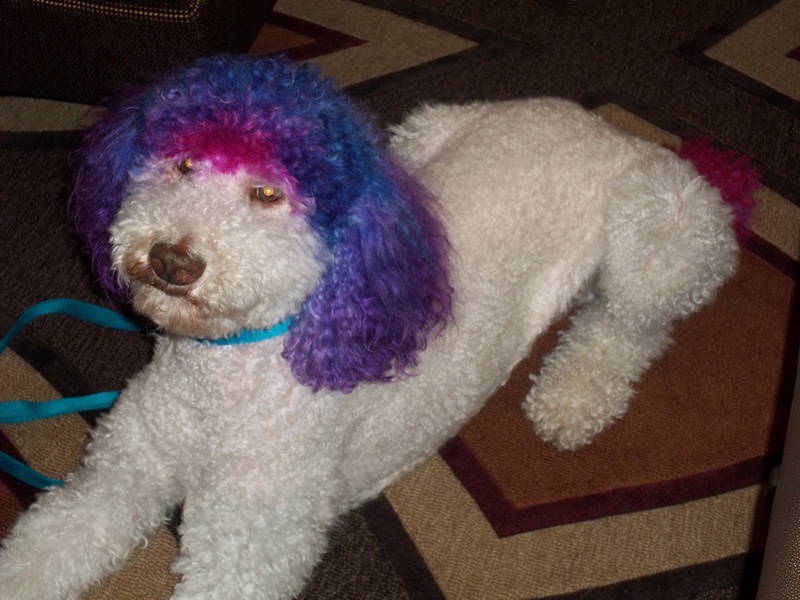 Love Chilly’s colourful hairdo! Chilly was a very cool dog. The crowd didn’t seem to faze him, he’d just lie down in the middle of everyone. Thank you so much for the nomination, if made me look at blogs that are fun and have lots of doggie (and some kitty) lovins. Exactly what I needed. Great article. My Ginger actually was prescribed Ativan for thunderstorms and fireworks. It was a very small dose and it sure helped her get through it all. I hated to see her tremble and hear her teeth chattering one more storm or fireworks display. Her vet said it was a very safe option for the anxiety associated with both. Keep up the good work!!! Thanks Nantz! I tried a low dose of Valium for Dudley when he started really going nuts over thunderstorms and it didn’t really help him. He was still terrified, but now he was stoned, too. Glad it worked for Ginger. Give Z-Kitty a little nip!